Game changer if it shoots. I like the idea but question the effect of moving to a 1/7 twist in 6mm. What effect will the extra torque on the rifle have? Or have we learnt enough now from 1000 yard BR etc to deal with that issue? The 107 BC’s referenced as being shot by Bryan Litz with Berger Bullets were the 107’s BEFORE we started pointing them. The .547 you are comparing that to is the BC AFTER we started pointing them. Not really fair to say that our BC’s are “off” when you are comparing what our competitor shot them at before we changed them. We have shot the pointed 107’s side by side (raced) in our 300 meter range next to the 105’s and our pointed 107’s had a high BC between those 2 lots. Berger knows as well as we do that BC’s change from lot to lot and even bullet to bullet. In the comparison we did, our lot of new pointed 107’s had a slightly higher BC than the 105’s. The 110’s are significantly higher than both. Editor: Matt, thanks for providing this information. We have updated this article to reflect your test results with the pointed 107s and new 110s. Kudos to Sierra for developing this new 110-grain MK. There seems to be considerable interest in this advanced projectile. Can you confirm that the meplats are pointed on the 110gr SMKs? The article above states Applied Ballistics has the 107 SMK @ 0.260 G7. I show a Litz G7 of 0.262 for the 107 SMK in the Shooter app…which was *before* Sierra started pointing the 107s and raised the highest velocity G1 to 0.547. Has Litz re-tested the 107s since they were pointed? If not, kinda changes the dynamic of the above post. 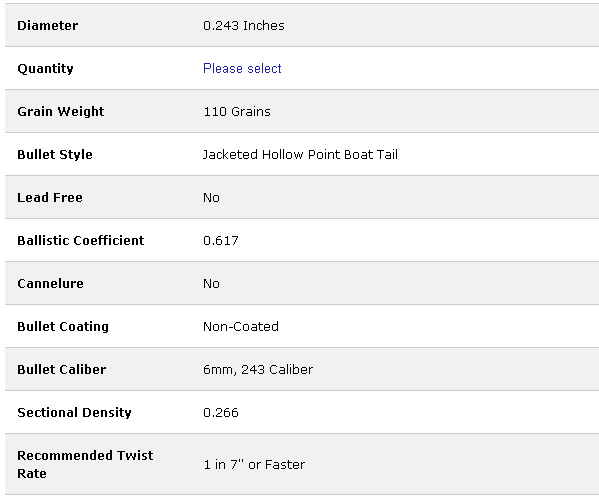 Editor: We used the “Litz data” shown in the JBM Ballistics App, which was 0.260 G7. I personally haven’t seen pointed 107s. I will say the pointing job Sierra does on the 183gr 7mm bullets is very nice. Sierra may recommend a 7 twist but i would just about bet an 8 twist will stabilize this bullet. Just as a 6mm 14 twist isnt supposed to stabilize a 68gr bullet, but it does quite well. I will be excited to get my hands on some of these new bullets for sure. I agree with Scott about the BC changing on the 107 SMK since they started pointing them a little over a year ago. I have done several test with the 107SMK and 105 Hybrids side by side with different muzzle velocity out to 1,100 yds. All of these test have resulted it the 107 out performing the 105 at the same velocity. If the 107 is shot at around 50 fps slower the drop at 1,000 yds is approximately the same. As for the 110 SMK, all I can say is that it is no joke! I have had the opportunity to do some testing with them and they will not disappoint. Also, a 1/7.5 and 1/8 twist barrel will handle them just fine. Looks like a 115 DTAC Killer to me. Basically same BC with 5gr’s less weight. Yes – the new 1575 WILL also be pointed just as the 7mm 183 is. This is basically a scaled down version of that successful bullet using the same 1.5 degree lead matching ogive. The 107’s have been pointed since we did the first run that way in Jan of 2014. What kind of overall length are we looking at with this bullet? I am very excited about these new 110’s! I can’t wait to get some loaded in my 6xc. Thank you, Sierra!! “Game changer” has been declared. Nope… Berger knows how to publish accurate G7 data for their own bullets. Hornady doesn’t have a Litz so they got a doppler. You can do better Sierra! I get to shoot 1000Y often, ive always found Sierra`a BC`s to prove out at the range. Sierra’s banded G1 BC’s are typically quite accurate. They get a bad rap sometimes because shooters don’t know how to interpret the velocity bands and just look at the high velocity number and say “that doesn’t match what I saw at long range”. If you average all Sierra’s velocity banded G1 BC’s (or use the actual bands in a ballistics program) you usually get pretty accurate drops. This problem isn’t helped by catalog companies like Midway that only have one number for BC and simply print the highest number with no mention of velocity bands. If this was your only source of info, it’s certainly misleading. Also, It’s been quite some time since we’ve (Applied Ballistics) measured the MatchKing line of bullets and many of them are now being pointed. This is the case with the 107’s discussed above. We’re making it a priority to update our measurements for bullets that have changed and will be re-measuring the entire MatchKing line of bullets for re-publication. As far as performance goes, this new 110 SMK looks pretty good. Just be careful to consider the whole range of velocity-BC’s, and not just the high velocity numbers. Sierra was perhaps the first to acknowledge the velocity dependence of BC’s and offer the velocity banded solution for G1’s. Over the years they’ve suffered from this approach because of shooters only looking at the high velocity number and then accusing Sierra of inflating BC’s. The solution is to provide a single G7 BC, averaged over long range. Nearly every other major bullet company (Berger, Hornady, Nosler, Lapua, and Barnes) have adopted G7 BC’s in recent years. Sierra has the ability to do the same if they chose. Either way, AB will continue to provide independently measured G7 BC’s for all brands as we always have. One caveat to the AB data, in this case the bullet changed since we last measured it, and so we’ll measure it again. Thanks for the explanation Bryan. In the hopes that you’ll see this, please consider focusing on lead free projectiles especially like the Cutting Edge MTH, Barnes LRX and TTSX. It’s becoming a legal requirement for many hunters to shoot lead free, and with those controlled expansion bullets it’s very important to be able to understand impact velocity for the sake of making an ethical kill. Of all the bullet types information on these is most lacking. This bullet is a game changer. I have done various BC calibrations over the coarse of 1000+ rounds with this bullet. From 1k to past 1 mile, the G7 has always been in the .310-.320 range. Testing out of a 6-Creed and 243win, the same powder charge under a 105 hybrid or 107 pointed SMK (both have almost identical POI at 1k) shows a 24″ improvement at 1000 yards despite 40 FPS less velocity! I am told Sierra manufactures the 115 Dtac bullet for David tubbs. Will this bullet also come nitride coated as an option? 8 twist is fine with these new 110MK, I shot them, no issues. I think you are correct, an 8″ twist will handle the Sierra 6 mm, 110 gr. MatchKing but probably not at 50-feet AMSL, 20 deg. Fahrenheit, 30.50″ Hg corrected barometric pressure and 3000 f/s muzzle velocity. Now at the Whittington Center in the Summer, there is no question, an 8″ twist is adequate for about Sg = 1.5 for the 110 gr. MK. 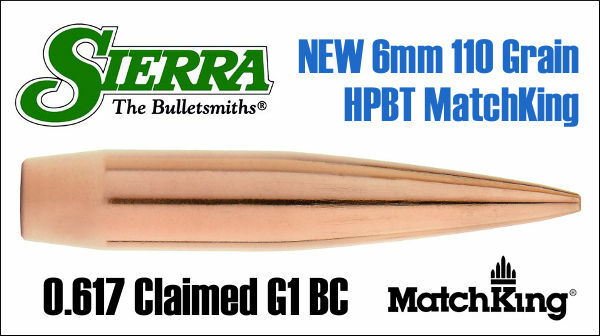 Please, as a matter of interest, in what conditions did the 8″ twist handle the new 6 mm Sierra bullet. It’s interesting with all this chat about the twist rate needed without mention of at what velocity. The faster you push the bullet, the slower twist rate is needed. This is just as confusing to some as the BC at a certain velocity… You need a certain twist rate for a certain velocity. So maybe 1:8 is OK but only if you run it fast enough.